Bilbao sits at the head of the Estuary of Bilbao in the Bay of Biscay, in the north central part of Spain, along the river Nervion. 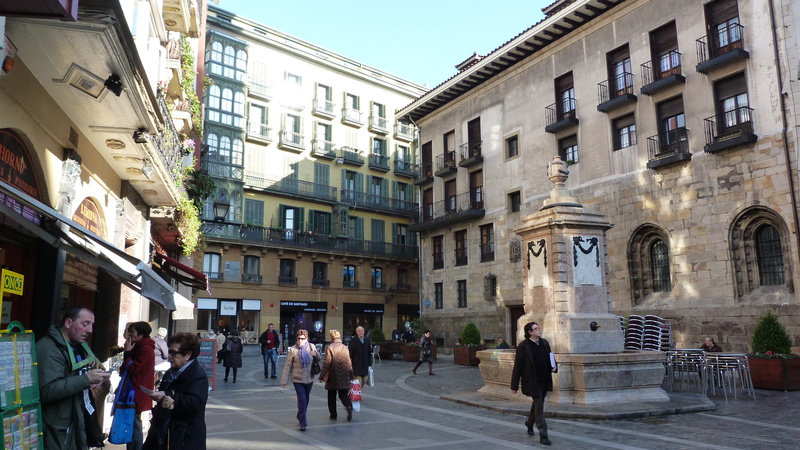 It is the largest city in the Basque country, which is an “autonomous region of Spain”. I have always heard about the Basque fight for rights and independence, but know none of the politics or history. 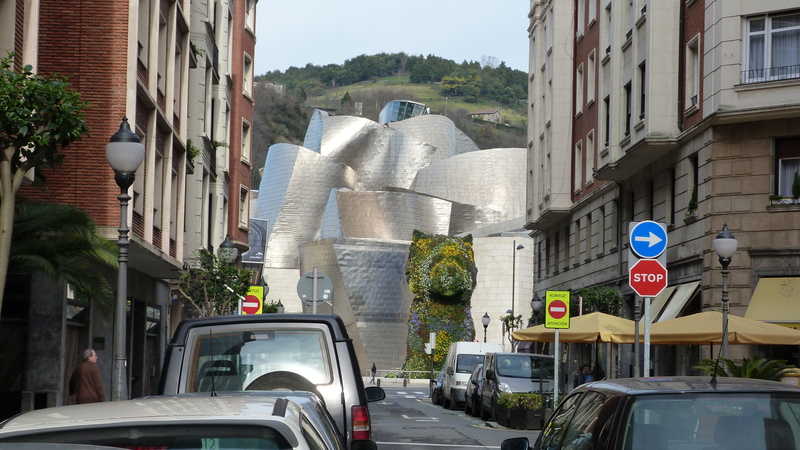 Going to Bilbao gave me an immediate appreciation for the distinctiveness of the region. No one in Bilbao refers to it as “Basque”. 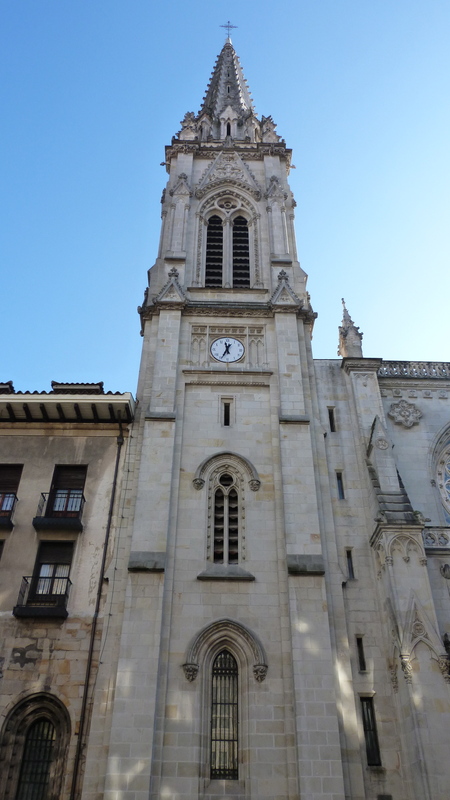 The correct name is Euskadi, which comes from the standardized version of the language, called Euskara Batua, developed in the 1960s and based on the central Basque dialect. It is now the most spoken language in the region and has official status in Spain. As a cosmopolitan city of 350,000, the tourist centres in Bilbao provide information in Euskara, Spanish, Catalan, Galacian, French and English. The minute we arrived we knew that we wouldn’t really have enough time to do the area justice. 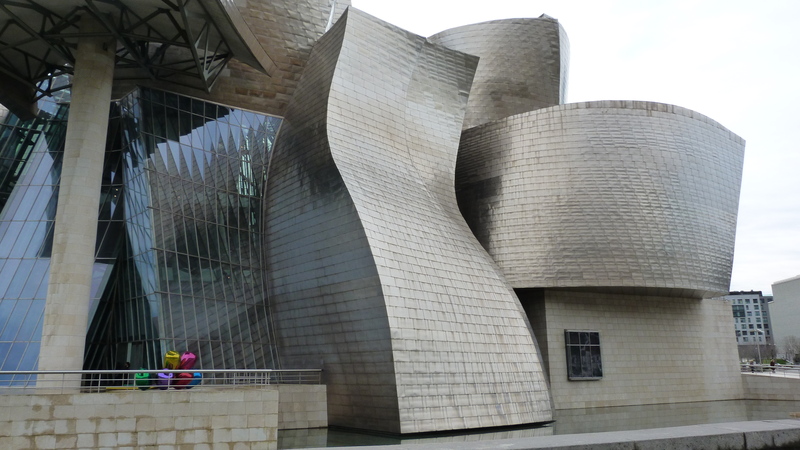 We had come to Bilbao from Barcelona to go to the Bilbao Guggenheim Museum. 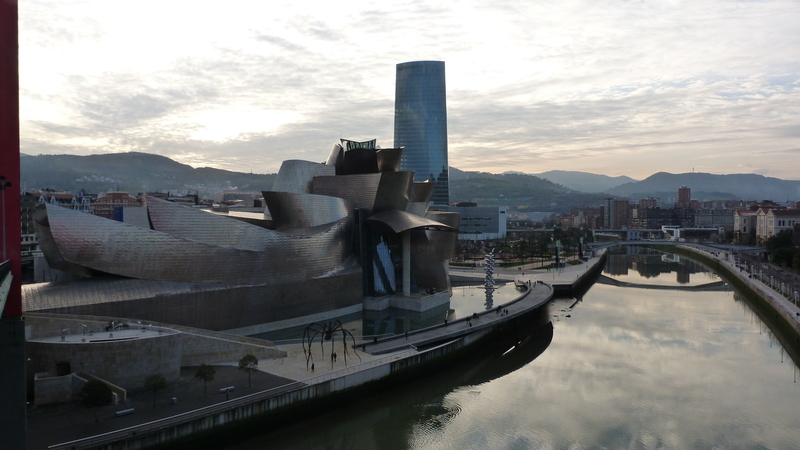 This world famous building was designed by Frank Gehry in 1997 and it has put Bilbao on the tourist map. 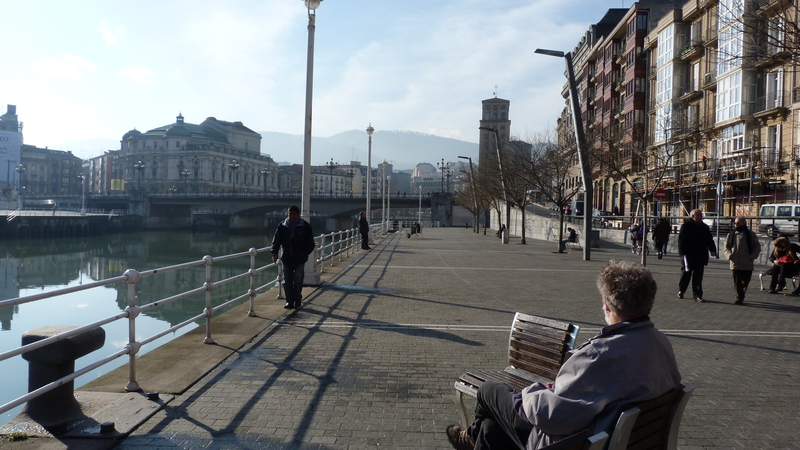 In 1995, before the museum opened, Bilbao had 25,000 tourists. In 2009 there were 615,000 visitors annually. 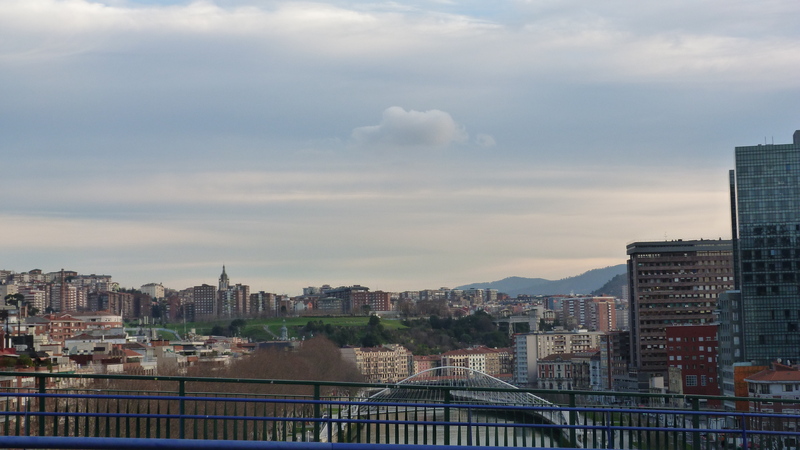 Bilbao is definitely worth the pilgrimage because, aside from the museum, it is a livable and welcoming small city with delicious regional cuisine. We arrived on a sunny morning, settling into a small hotel in the old city Casco Veijo. The original city was developed in 1300, with the cathedral at the centre of seven streets surrounded by a walled enclosure. It has a picture perfect central square with stores, cafes and a very friendly feel. A quick café con leche and we headed out for a sunny walk along the river in search of the museum. Bilbao has a great river walk, with dramatically designed bridges and wonderful buildings set against a mountain backdrop. It is the perfect way to come upon the Guggenheim Museum bringing you, effectively, from the back around to the front of the museum. There is a reason why this building is world famous. It is a stunning sight from every viewpoint and much larger than any of us had imagined. We kept circling around it, trying to fathom its shape, which seemed infinitely changeable. Being on a river, it was designed to resemble a ship, but one that is in constant motion. The organic sculpted contours create folds, curves and angles that catch the light. 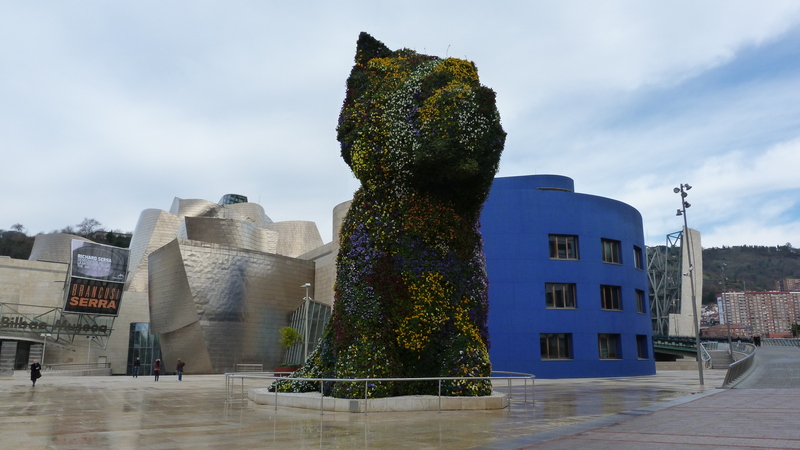 When we finally made it to the front of the museum we found “Puppy”, by Jeff Koons, a wonderful living sculpture. “Puppy” sits out front fully clad in flowers that change with the season. It is about 20’ tall and gives an incredibly cheerful welcome to the museum. Inside, the museum was equally surprising. We toured the space, walking out onto the terraces and touching the soft titanium panels of the outer shell that remind you of fish scales. The museum is the art that people come to see and we were not disappointed. We did take some time to go through the exhibits, of course. A vast Richard Serra show, built for the gallery, takes up almost half of the first floor. The show is very much an extension of the gallery, losing us in a maze of metal, making us dizzy in the weight of the structures around us. I’ve never really appreciated Richard Serra, but seeing this work, in this space, was quite mind-bending. Serra’s work was paired with the sculptor Constantin Brancusi. A marvelous room with soaring high ceilings was the perfect setting for Brancusi’s bird sculptures. After the density of galleries in Italy, it was wonderful to see these sculptures given such an open, spacious setting. We walked back along the river, and journeyed back in time to the old city. Tourists off-season, we went to dinner early, 9:00, for meal of new fish discoveries. Tim had the “best fish soup” of his life – a dark rich thick broth that made every other fish stock seem anemic. We each had different kinds of fish – biscayan cod, gilthead fish, pastry parcels stuffed with mussels and prawns, monkfish. Up early the next morning, we decided to visit the market, to see some of these local fish on offer. On the way we passed a small park that had public exercise equipment, designed for easy use. A woman was sitting reading her paper while quietly biking in place. 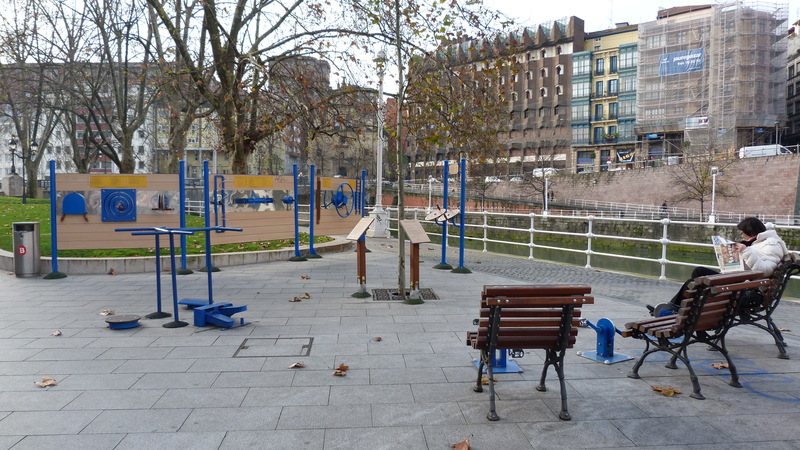 This is not a place for heavy sweating, but a lovely way to build up a few muscles, gently, while still enjoying the river. After all of our eating, we probably should have spent more time there. Our last adventure in Bilboa was to take the Metro out the old port of Getxo. 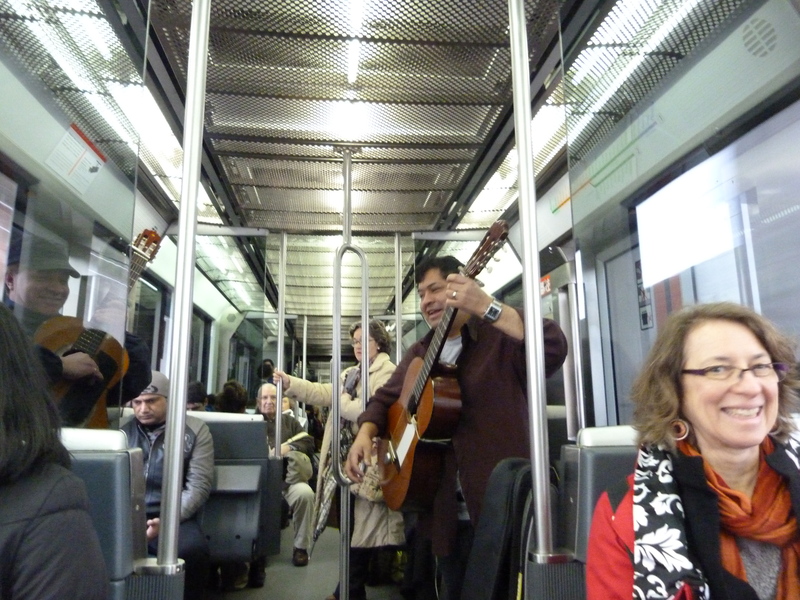 The Bilbao Metro is clean, efficient and easy to use. In fact we were treated to some great entertainment en route with a couple of Mexican mariachi musicians serenading the car. Probably illegal, we realized, as they hastily put everything away before the doors opened at the next stop. But quite wonderful for us. 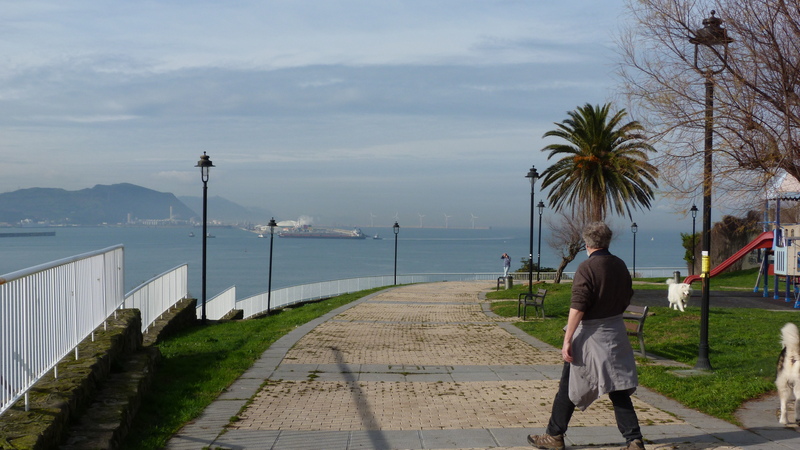 We didn’t have much time to explore Getxo, unfortunately. But we were able to walk in the sunshine, look out to the Bay of Biscay, and to see some of the ships that brought us our fish last night. 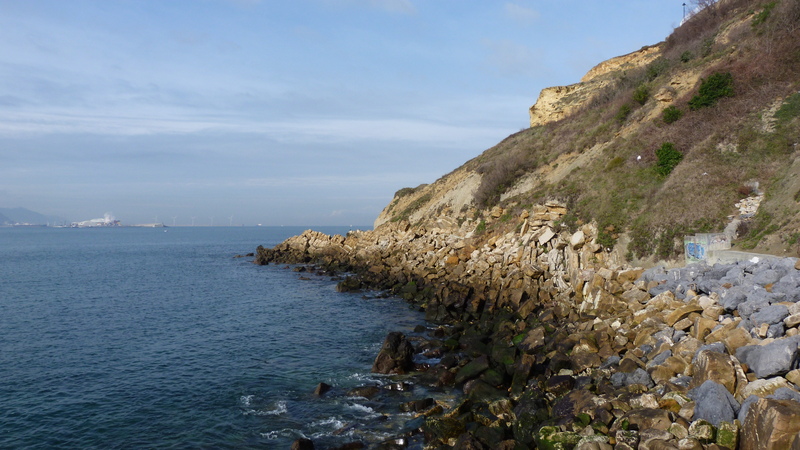 We spotted a restaurant on the edge of the cliff. A quick climb and we were sitting outside in the sunshine, enjoying delicious local olives, perfect salads with gorgeous fresh anchovies and local wine at Cafe Usategi Algorta. It’s an amazing restaurant with many local specialties, and a complete surprise for us. We had come with no expectations and were treated to one of the best meals of our stay in Spain. 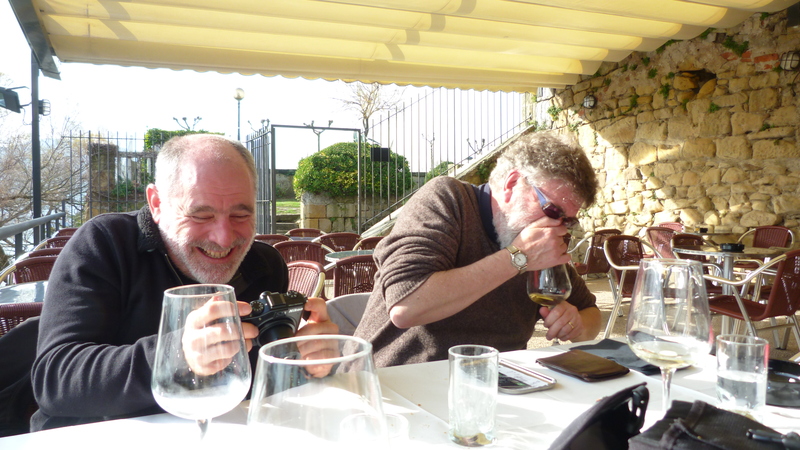 Our visit to Euskadi was all too short.